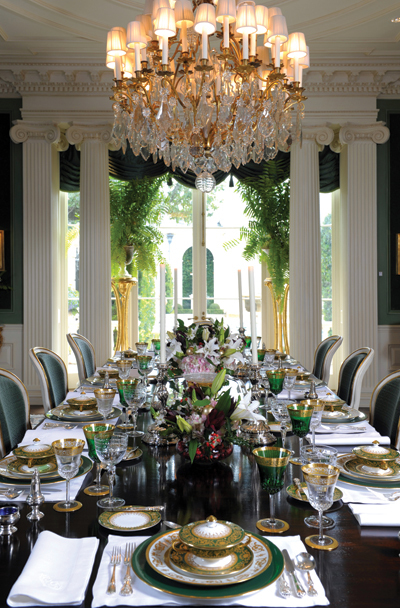 The dramatic dining room is a study in grandeur with columns framing the large glass French doors that overlook the pool and front garden; interior designer Alexa Hampton designed the table and chairs|! !| making the chairs larger and more comfortable than usual antique chairs. While the Canizaros’ home is an architectural and interior design gem that was featured on several pages of Architectural Digest magazine and on the cover of the book The Language of Interior Design by Alexa Hampton, their interior designer, it’s also a warm and inviting home that’s often shared with nonprofit groups, such as a Longue Vue House and Gardens fundraising event and religious groups associated with their Catholic faith. Designed by New Orleans architect Peter M. Trapolin, AIA, and built by Michael A. LaForte Jr. of Vintage Construction Company of New Orleans, Inc., the house took four years to construct. “Peter did an outstanding job designing our home, Michael was a great contractor and we can’t say enough good things about Alexa, who gave us everything we wanted in a formal, yet comfortable, home,” says Joe, the founder, chairman and CEO of Columbus Properties LP, a commercial real estate development company, president of First Trust Corporation that includes First Bank and Trust, and a well-known philanthropist. “We are pleased that so many of the antiques and accessories in our home came from the great antique shops in New Orleans,” Sue Ellen says, and she also notes that it was local artisans who did the first-class job on the details throughout the house. Sue Ellen and Joe concur that the Christmas season is their favorite time of the year to enjoy their home. The chapel’s handcrafted pews and altar were created by Thomas Bruno, a New Orleans sculptor and furniture maker. The scared art treasures make the chapel even more special at Christmastime,” Joe Canizaro says. Thomas Bruno, New Orleans sculptor and furniture maker, made the altar and benches for the chapel that’s at the core of the Canizaros’ home; a 17th century painting depicting the ascension of Christ is affixed to the ceiling. Cherished Christmas decorations collected over the years adorn the tree in the family room. The warm glow of Christmas is evident when the holiday lights come on at dusk. The broad loggia allows light to flood the house through a series of arched windows and French doors. The grand staircase in the rotunda is further dramatized by the marble floor and majestic antique crystal chandelier. A treasured circa 1480 painting entitled “Adoration of Christ” by the famous Italian artist Sandro Botticelli has a place of honor over the fireplace in the library. Sue Ellen and Joseph “Joe” Canizaro in their Metairie Club Gardens home adorned for the Christmas holiday season.